On Tuesday, January 13 Athens was recognized by the National Trust for Historic Preservation as one 2009 Dozen Distinctive Destinations. Athens is the first Georgia destination to receive this national designation since 2004, when Macon made the list. 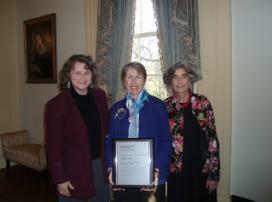 Athens-Clarke Mayor Heidi Davison was presented with an award plaque from Karen Nickless, Southern Office field representative of the National Trust for Historic Preservation, at a ceremony held at the Taylor-Grady House, a National Historic Landmark. More than 80 local and state representatives were present, making the event an overwhelming success. As Mayor Heidi Davison said, "Where else can you find the location of the first Garden Club of the United States within blocks of the headquarters of one of the most successful rock bands in the world?" Congratulations to all those who have helped restore our city to its "classic" charm. Be sure to check out all the photos here and keep a look out on the Athens CVB youtube channel for video from the ceremony at the Taylor-Grady House to come!